The players offer their thoughts on the Power's big win over Melbourne in Alice Springs. On the fringe of the Power’s best 22, O’Shea played the final nine games last season when the side was hampered by injuries. He will need to improve his consistency if he is to cement his place as a first-choice defender. Importantly, O’Shea offers Port great versatility given his size and ability to run. He has the tools to become a regular at Alberton. His local club is the Victorian-based Emerald Football Club from where he was given the opportunity to play for TAC Cup side Eastern Ranges. Debuting with several other youngsters against reigning premiers Collingwood in Round 1, O’Shea played 18 out of 22 games in his debut season. Predominantly playing on the wing and across half-back, it was a baptism of fire for the young O’Shea who faced off against Eagles star Andrew Embley on one occasion. His season started with a solid 15-disposal performance against St Kilda in Round 1, however he soon struggled through prime fixtures against early-season premiership fancy Essendon and grand finalist Sydney in Round 3. Having been dropped back to SANFL side South Adelaide, O’Shea was able to put together some consistent performances playing on a wing and was an emergency against Fremantle and Geelong before injury saw him sit out the second half of the season. 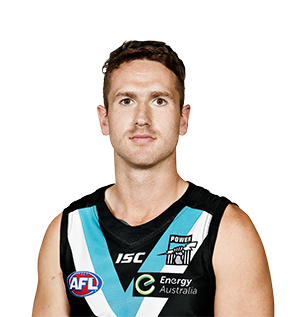 After a slow start to the season, O’Shea cemented his place in the AFL side with a string of 20+ possession games in the back half of 2014. Was omitted from the Power’s Round 23 clash against Fremantle in Perth because of match-ups, but returned to play a key role in the Power’s finals campaign. 2015 followed a similar pattern to 2014, with O'Shea forcing his way into the AFL side in the back end of the season and keeping his place. Home games against GWS and Fremantle were two of O'Shea's best in 2015.